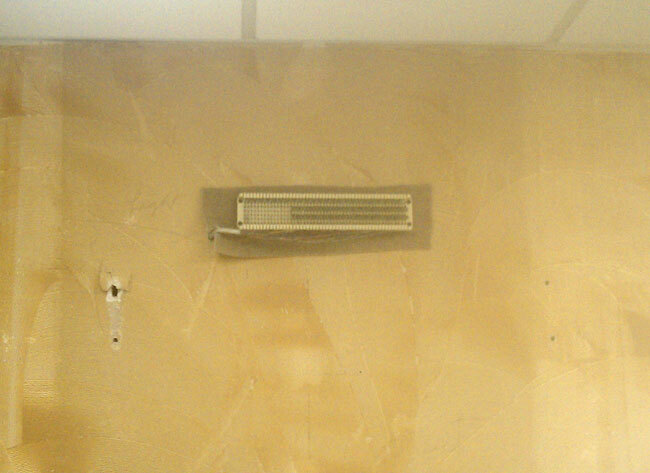 The mystery type 66 punch block mounted high up on the wall in the hallway. The contractors are removing the carpeting on the wall and drywalling over it, when they reached this, they just cut around the block and kept going. On one side is a teflon jacketed 25 pair category 3 phone wire, which goes back to the rack room, somewhere. The rack room is a little disorganized and it is difficult to mess around with the various bundles of wire without knocking a station off the air. On the other side is a bunch of 1N1004 diodes punched down. Perhaps some sort of door light circuit? Or maybe a remote channel selector for one of those old Scientific Atlanta 7300 series satellite receivers? I don’t know. I used my big wire loppers and cut the cable. There were no sparks and everyone stayed on the air. I pulled the whole thing down and removed it, so the drywall contractor can finish patching the holes. The entire facility is getting gutted and redone soon.